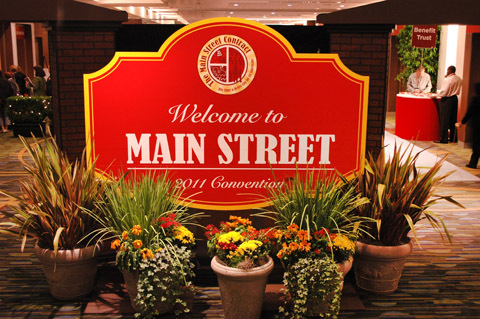 2011 Nurses Convention — John Murray Productions, Inc. The biennial Nurses Convention took place this September at San Francisco's Marriott Marquis, and John Murray Productions, Inc. was brought on once again to provide the scenic environment for this year's Main Street theme. 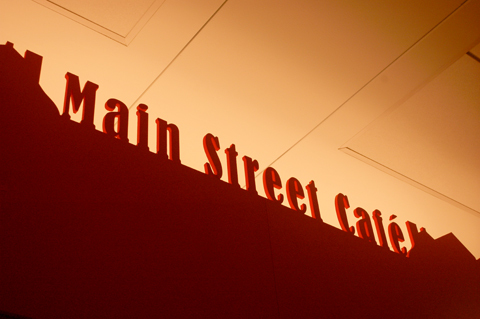 In collaboration with MetroMedia Productions, Inc. and BP Productions, we created an outdoor feel within the Yerba Buena level of the hotel by creating a Main Street America, complete with a local newspaper, internet cafe, technology library, medical center, and general store where guests could mingle and be educated on the Union cause. The main stage in the ballroom served as the Town Hall for the attendees throughout the event, transitioning to party zone in the evening where the nurses came to do karaoke and dance the evenings away. 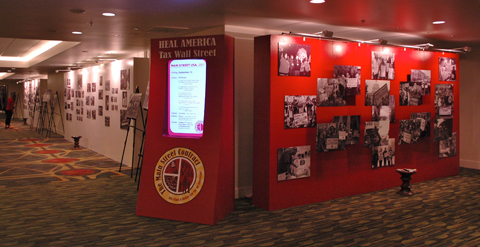 The Golden Gate level was also transformed for the Nurses' continuing education courses, with the Mission Tunnel acting as the Nurses Art Gallery where images of union members in action were displayed on two 8'x20' flatwalls. The 4 day event was designed to unite the nurses in their cause, with special guests Michael Moore and Governer Jerry Brown in attendance. Overall, the event was a huge success and the client extremely pleased with the outcome.